Union Minister of Commerce & Industry and Civil Aviation, Suresh Prabhu, interacted with the trading houses and exporters in New Delhi today. He sought their suggestions on formulating a strategy for increasing exports by USD 100 billion in the next few years.Commerce and Industry Minister informed that the export performance has been encouraging, last year, merchandise exports crossed USD 300 billion and registered a growth of 10%, while in 2016-17 it was 5%. Total exports, including services, were at USD 498.47 billion and were up by 13.5% in 2017-18. This year also there has been a growth in merchandise exports of more than 20% each in May and June.Government has taken initiatives to boost exports. Mid-term review of the Foreign Trade Policy was undertaken which led to increasing export incentives by 33% for MSME and labour intensive sectors. Earlier, Exports Relief Package was announced by GST Council restoring schemes of duty free procurement of inputs for exports under Advanced Authorisation/Export Promotion Capital Goods. Government has been proactive in GST refunds through the refund fortnight organised in March and June 2018. More than Rs 40,000 crore have been refunded so far. Refund processes are being streamlined further and made fully automated. The Minister stated that he has already held two rounds of discussions with Secretaries of key Ministries for preparing sectoral export strategies. He said that States are also being consulted for preparing State specific export strategies. 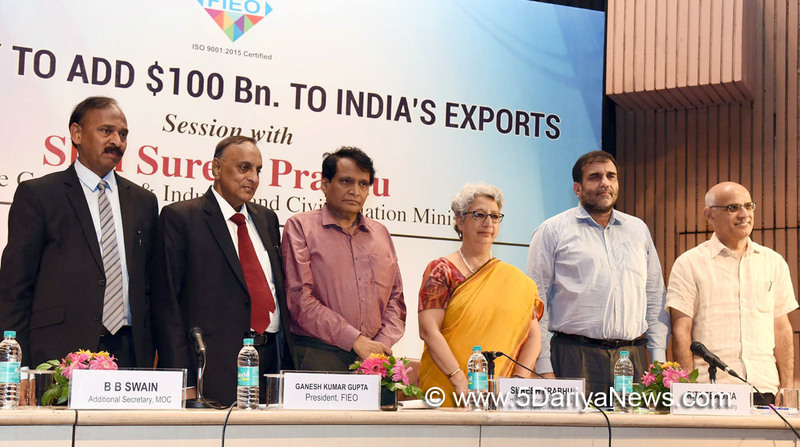 The FIEO was asked to prepare a strategy for increase in exports by USD 100 billion in the short term. EXIM Bank has also submitted its report about market research for exports. He urged the exporters to come up with suggestions to further increase exports by another USD 100 billion in short term.Exporters raised concerns about uncertainties in international trade like tariff increases, volatilities in currencies and review of GSP regime by US. Political developments in Iran, Russia and the Middle-East have added to the uncertainties. Domestically also, cost of credit is showing upward trends, banks are adopting rigid approach in disbursement of credit and liquidity challenges will continue to exist until GST refund process is made fully automatic with minimum human interaction. Exporters suggested for providing branding assistance in existing and new export markets, using Lines of Credit as marketing tool, support for Research & Development, and promoting e-commerce.Commerce and Industry Minister assured the exporters that Government is fully seized of their concerns and is addressing them in the best interests of the country. He said their suggestions will be incorporated in the comprehensive export strategy to be finalised soon.In the interaction, a four-pronged strategy prepared by FIEO for increasing exports by USD 100 billion was discussed. FIEO has identified 685 products based on past Indian export performance and global import performance of various products.The workshop was organised by Federation of Indian Exporters Organisation (FIEO) and was also attended by Commerce Secretary, Ms. Rita Teaotia, OSD, Dr. Anup Wadhawan and DGFT, Alok Chaturvedi.